If I were to dedicate blog posts, I would dedicate this one to my nephew, Cameron. I imagine he will gasp, just like I did, upon seeing this incredible (very American) breakfast creation. I may be late to the game but when I saw these things on my friend Bob's facebook feed yesterday I was ready to go buy bisquick and bacon. 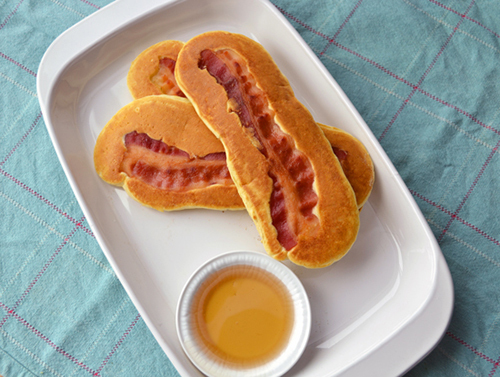 These are Bacon Pancake Dippers, a sublime idea if you ask me- either for breakfast, a weekend brunch or any occasion where one desires grease and carbs. This recipe comes via duhlicious.com and I will be making it very soon...you?